Looking at some of our "over the top" Christmas planner tours, it can be hard to imagine using these works of art to actually organize the Christmas holidays. That's why blogger Headly's hard-working Christmas notebook is worth the tour: it shows the nuts and bolts of using a Christmas planner to get organized for the holiday season. Hassel-Free Holiday Planner ... Plus Printables! 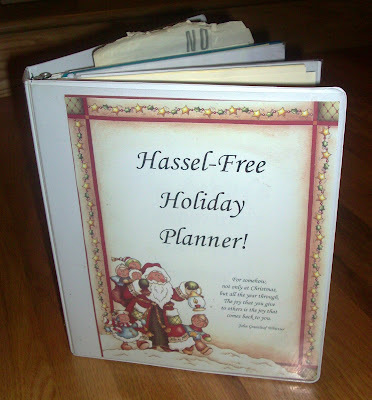 It's a real-life Christmas notebook tour with a printable plus: a "Hassel-Free Holiday Planner"! Blogger FawnDear, citing our Organized Christmas site (thank you, dearie! ), joins the fun with a photo tour of her "Holiday Brain". To inspire you, she's shared her personal Christmas countdown, and created a few free printable planning pages. Enjoy! Christmas Countdown Planner: Creative Kristin! Scrapbooker Kristin, blogging as Artfully Inking, shares a very creative Christmas planner with this notebook tour. Using trimmed, oval-shaped Christmas Countdown forms from OrganizedChristmas.com, she's crafted pretty chipboard covers and dividers for a custom, one-of-a-kind creation. Think all Christmas planners have to be artsy and "over the top" to make the grade? Not so! 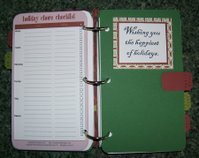 A simple three-ring binder notebook makes a fun and functional Christmas planner. Check out this in-depth notebook tour from blogger Practically Pink as she follows the Holiday Grand Plan to prepare for the holiday season. 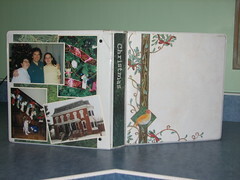 Visitors to OrganizedChristmas.com often wonder: how do you make a Christmas notebook? 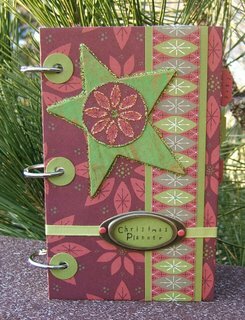 Check out this Christmas Notebook Tour from our friend, Melinda Whitehead. If a picture tells a thousand words, there's a long novel here: LauraKaye's Holiday Grand Plan binder tour! It's that time of year: we're building Christmas notebooks or holiday organizers to help us plan and prepare for the holiday season.